According to him there was one set of many volumes that pertained to Highland Park with a first edition of 1916...and there is another slightly different first edition for what pertained to Rouge starting publication in 1923. He also said that there was also a period in the 1930's where either Popular Mechanics, or Popular Science offered reprints for sale. I know we have a bunch of collectors of related items to our T...so, anyone ever heard of these 'textbooks' as originals or reprints? I have to start digging in book boxes at 'sales' if this is true.... Heck, If I could find a set, I might even be willing to take them to reprint for others and not look to make a buck on the pass thru! Any hints, leads, or authenication of his story? I have one,marked H.F. Trade school,Shop Theory. Mine was printed in 1943. It came from The Indianapolis War Production Training Program. The Detroit Historic Automotive Collection at the Detroit Public Library on Gratiot in Downtown Detroit can probably answer your questions and point you in the right direction. I have a couple of books from the Ford Trade School and they are very good. Basic tool and die, metallurgy etc. Where else can you get the info about spark testing (grinding) a piece of steel to determine its composition. I have occasionally thought about trying to reprint them. Paige Plant at the library can probably help you. Another obvious source is the Benson Ford Research Center at the Henry Ford in Dearborn. Worth a trip to see it all. It is amazing in Detroit area how many good tool and die items are for sale at the flea markets. With the demise of America's great manufacturing capabilities the apprentice programs are gone and "grandpas" tools end up at the flea market. I buy Sterrit micrometers for a $1.50! Somehow I just can't pass them up. So much for the Arsenal of Democarcy. Look on fleabay under Ford Trade School. half a dozen of the text books. I used to know a man who's father went to the Ford Mechanic's school to learn to fix Model T's. I haven't seen him in several years. He had his father's 1924 Touring and it was the car that I first photographed to get measurements for my car. Thats for confirming and I just don't know why I never saw one or heard of one before. Thanks Jon, looks like a start is fleabay and I never thought of that as a 'source'. 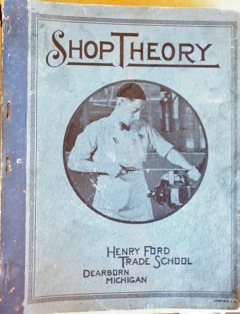 Henry Ford trade school books are very easy to find. The hardbound books were the ones printed for use outside of the HF Trade Schools located at Highland Park & the Rouge plants. These were printed by the thousands if not tens of thousands and used in classes ranging from high school to college & trade schools. The blue paper back copies were the ones given to students at the Ford schools. The Ford Apprentice school was a training program starting in 1923. HF trade school alumni usually got preferential treatment here. In 1941 it merged with the UAW to become an independent school from HF trade school. Henry II killed the HF Trade School in 1952, but HF trade school books can still be found with printing dates of 1952 & 1953. One little piece of trivia- Frederick Searle who was the head of the HF Trade School was one of Edsel Ford's school teachers. 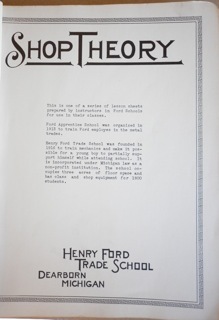 Henry Ford talked him into overseeing the trade school and he did so for many years. A 3 year course, which involved working along side regular plant employees, men between the ages of 20-25 we selected. They were paid $6 a day increasing to $8/day. This is from a 1927 copy of the Dearborn Independent in my files. A link to some good information on the school. I have now been able to find out exactly what books were used as part of the curriculum as to the complete set. John Page is correct, the first edition, like many first editions of anything is pretty tough to get, but a fair smathering of the 1941 reprints of the 1934 edition can be found at not too difficult to swallow prices. Coincidentally, my first post seemed to spark some stealth interest as anything reasonable on flea bay was snapped up in 24 hours of my post before I could even figure out what a 'complete set' was. For anyone who attended a USN Class A school to achieve a striker rating, the complete set is pretty much the same curriculum as used for Machinist Mate or Foundryman school, and does get a little pricey by the time a complete set of the books is put together. For anyone considering adding to their own library, the 'meat' is the Shop Theory Book, and shows some interesting tid-bits of general industry machine shop practice of the era...all the others just go along for the ride.